Robinson Point, west coast of Isle au Haut; south side of western entrance to Isle au Haut Thorofare. Private residence, overnight stays allowed. The island of Isle au Haut is still one of Maine’s truly rustic island communities, and visitors will find the experience comes very close to what life would have been like for the lighthouse keepers. Today there are only about 50 year round residents, and most houses still don't have electricity. Isle au Haut was also the nation's last community to stop using crank-style telephones. Isle au Haut Lighthouse was built in 1907 to guide mariners away from the rocky shoreline along the island, most of which is part of the Acadia National Park system, and was the final cylindrical brick light tower to be constructed in Maine. Land for the station on Robinson Point was purchased from Charles E. Robinson as the light was also called Robinson Point Lighthouse, although today it is more widely known as Isle au Haut Lighthouse. Robinson’s Point, where the lighthouse sits, leads into a shelter between Isle au Haut and Kimball Island where boats can find refuge during a storm. The Victorian style keeper's house sits atop a rocky ledge connected to the lighthouse by a walkway and is popular today as a bed and breakfast for tourists. The first keeper was Frank Holbrook, previously stationed at Matinicus Rock. He stayed until 1922, and was replaced by the only other keeper, Harry Smith, who stayed on until it was automated in 1933. The property was then purchased by long time resident Charles Robinson, who originally sold the property to the government for the station. For the next 50 years generations of the Robinson family would spend their summers at the lighthouse station. In 1896, the property, minus the tower, was purchased by Jeff and Judi Burke. Judi was the daughter of a former Coast Guard keeper at Highland Light, Massachusetts. The Burkes converted the keeper's house into a bed and breakfast inn called the Keeper's House Inn, and Jeff even wrote a book that chronicled their remarkable efforts in making the place a confortable rustic experience for their visitors. They stayed on for over 20 years and sold the property to Dr. Marshall Chapman, an associate professor of geology at Morehead State University. The keeper’s house and lighthouse were then converted to a self-sustaining property. As stated on Chapman’s website “The property is an ecologist's dream. Powered by state of the art photo-voltaics and a 30 kilowatt generator, fed by unlimited crystal-clear water drawn from the sea by the magic of a reverse osmosis system, a garden-setting sewage treatment system using peat bogs and flower beds.” Chapman also stated he wanted the Burkes to stay on as consultants, to which the Burkes excitedly agreed. Isle au Haut is accessible by the Isle au Haut Ferry from Stonington, but it is not a car ferry, nor does the Isle au Haut allow automobiles. The mail boat takes about 40 minutes to reach the island. The mail boat also has a special four-hour lighthouse tour on Sundays once a month to view six lighthouses. Old Quarry Ocean Adventures provides views of the lighthouse (sometimes lands on the island) and five others on its lighthouse tours. Windjammer cruises out of Camden, Rockland, and Rockport may pass by the lighthouse. The lighthouse grounds are open to the public, with accommodations for overnight stay at the keeper’s quarters, and a few limited homes. Want to stay at a lighthouse that is a product of conservation? Isle au Haut Lighthouse is solar powered, transforms seawater to clean drinking water, and uses compost for waste, among other methods to keep it self sustained. The Keeper’s House Inn at the Isle au Haut Lighthouse station provides few amenities and plenty of opportunity to disconnect from life’s hectic pace. The lighthouse is about a mile hike from the town landing. The lighthouse is technically considered to be part of Acadia, facing Penobscot Bay. About half of Isle au Haut is federal parkland under Acadia National Park, the other half is privately owned, supporting summer residents and a year-round fishing community. To camp in the Acadia Park, reservations must be made in advance. There are 17 miles of hiking and biking trails on this island, along nature preserves, providing bird watching and a small beach area, but bring your own supplies, as there are few amenities here. If you are looking for a true rustic experience, to get away from modern civilization, this is the place. 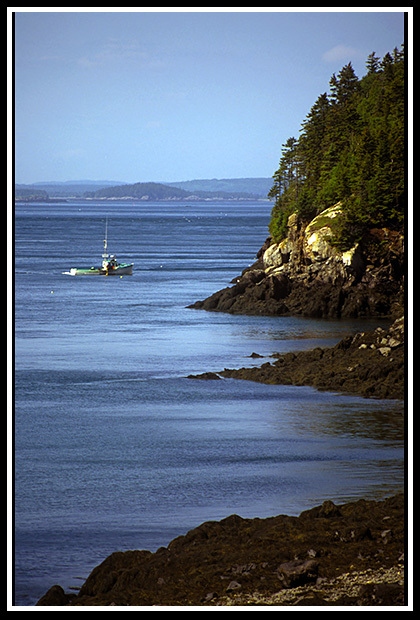 The Isle au Haut is accessible by the Isle au Haut Ferry from Stonington. Heading Southward, take US Route 95 to Bangor then 395 to Brewer, then take Rte. 15 south to Stonington. The lighthouse is about a mile hike from the town landing. Boat tours mentioned below may offer many types of cruises. Some offer specific lighthouse cruise that pass by Isle au Haut Lighthouse, and some will pass by the lighthouse during narrated wildlife and historic tours, while ferrying passengers, or fishing tours. Daily mail boat trips to Isle au Haut in the summer season and offers two trips to 5 additional lighthouses in the fall. They have also included lobster and fishing tours. 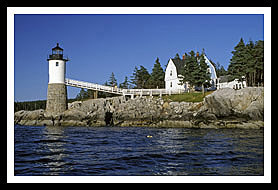 My 300-page book (with over 360 images), Lighthouses and Coastal Attractions of Northern New England: New Hampshire, Maine, and Vermont, provides human interest stories from each of the 76 lighthouses in the northeast coastline, along with plenty of coastal attractions and tours near each beacon, and contact info to plan your special vacations. You'll also find lighthouses you can stay overnight at.